Northwestern Engineering’s Manijeh Razeghi has received the 2018 Benjamin Franklin Medal in Electrical Engineering from The Franklin Institute, one of the oldest centers for science education and development in the country. Among eight researchers in the Institute’s Class of 2018, Razeghi will officially accept the award at the institute’s awards ceremony on Thursday, April 19, 2018 in Philadelphia. Founded in 1824 to honor Benjamin Franklin, The Franklin Institute recognizes excellence in science and technology through its annual awards. Previous winners include Nicola Tesla, Marie Curie, Thomas Edison, and Albert Einstein. Founding director of Northwestern’s Center for Quantum Devices, Razeghi is a leading scientist in the field of the science and technology of semiconductors. Her work is a multidisciplinary combination of solid-state physics, quantum mechanics, materials science, and electrical, mechanical, and chemical engineering. 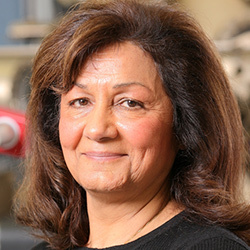 Among her many projects, Razeghi develops advanced semiconductor devices, including lasers, optoelectronics, photodetectors, transistors, waveguides, and switches. As system-level extensions of this work, she has also created large-format night vision cameras and a tunable, monolithic, mid-infrared laser system. Razeghi has received numerous awards throughout her career, including the Jan Czochralski Gold Medal from the European Materials Research Society, IBM Europe’s Science and Technology Award, the Society of Women Engineering’s Achievement Award, and the IBM Faculty Award. She is also a fellow of the Materials Research Society, Institute of Electrical and Electronics Engineers, Institute of Physics, American Physical Society, Optical Society of America, Society of Women Engineers, and Society of Photo-optical Instrumentation Engineers.